The OptoMOS® line of solid state relays uses discrete semiconductor components and the patented OptoMOS architecture to deliver fast, reliable, bounce-free switching in a compact design. From one of the world's smallest single-pole, 4-pin relays to multi-pole and multi-function devices, OptoMOS products are an ideal solid state replacement for larger reed and electromechanical relays. 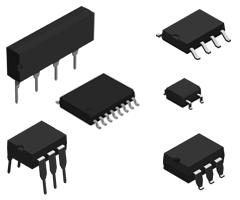 Compared to these old electromagnetic technologies, our OptoMOS relays offer significantly lower drive current, small package size, no susceptibility to magnetic interaction, and solid state reliability. All of these are key requirements for the design of today's complex, low-power, multi-channel products. The small 4-pin SOP relays combine our state-of-the-art double-molded, vertical-construction packaging with high performance to give you a reliable product with up to 20% savings in board space compared to other 4-pin products. The dual-pole OptoMOS relays combine two independent relays into a single 8-pin package, paving the way for designers to condense more functionality into a single component. And the common-input OptoMOS relays provide a design alternative where two independent outputs are driven by the same input signal. "Advantages of Solid State Relays over Electromechanical Relays"
* Device incorporates current limiting circuitry.